Reliance Capital Limited is an Indian diversified financial services holding company promoted by Reliance Anil Dhirubhai Ambani Group. Reliance Capital, a constituent of Nifty Midcap 50 and MSCI Global Small Cap Index, is a part of the Reliance Group. It is amongst India's leading and most valuable financial services companies in the private sector. As on March 31, 2017, the net worth of the company stood at Rs 16,548 crore, while its total assets as on the date stood at Rs 82,209 crore. In Fortune India 500 list of 2018, Reliance Capital was ranked as the 77th largest corporation in India with 5th rank in 'Non-Banking Finance' category. Reliance Capital has businesses in asset management, mutual funds, life insurance and general insurance, commercial finance, home finance, stock broking, wealth management services, distribution of financial products, private equity, asset reconstruction, proprietary investments and other activities in financial services. The company operates across India and has over 20 million customers and workforce of approximately 15, 595 as of May 1, 2017. 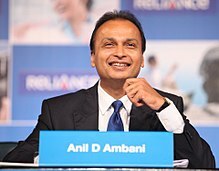 Anil Ambani, promoter of Reliance Group is the Chairman of Reliance Capital, while Amitabh Jhunjhunwala is the Vice-Chairman and Anmol Ambani as the Executive Director. In 2002, Reliance Capital Ltd shifted its registered office to Jamnagar in Gujarat before it finally moved to Mumbai in Maharashtra, in 2006. In 2006, Reliance Capital Ventures Limited merged with Reliance Capital. With this merger the shareholder base of Reliance Capital rose from 0.15 million shareholders to 1.3 million. Reliance Capital entered the capital market with a maiden public issue in 1990 and in subsequent years further tapped the capital market through rights issue and public issues. The equity shares were initially listed on the Ahmedabad Stock Exchange and the Stock Exchange Mumbai. Presently[when?] the shares are listed on the Stock Exchange Mumbai and the National Stock Exchange of India. Reliance Capital obtained its registration as a non-banking finance company (NBFC) in December 1998. It has since diversified its activities in the areas of asset management, life and general insurance, commercial finance, stock broking, private equity and proprietary investments, asset reconstruction, distribution of financial products and other activities in financial services. Reliance Capital has a net debt equity ratio of 1.88 as of March 31, 2017. It is one of the top rated Indian financial institutions and has the highest ratings of ‘A1+’ by ICRA and CRISIL for its short term borrowing program, and ‘CARE AAA’ by CARE for its long term borrowing program. Reliance Capital offers a range of financial services in many business lines. The company is one of the most diversified financial services firms in India with interests expanding from asset management, insurance, commercial finance, broking, private equity to other niche financial services. Its prominent businesses are as follows. Reliance Nippon Life Asset Management (RNAM; formerly Reliance Capital Asset Management Limited) is one of the largest asset manager in India and manages and advises Rs. 3,58,059 crore as per March 2017, across mutual funds, pension funds, managed accounts, alternative investments and offshore funds. RNAM is the only AMC to have the mandate for fund management by EPFO, PFRDA and CMPFO. RNAM is the asset manager of Reliance Mutual Fund (RMF) Schemes. Sundeep Sikka is the Executive Director and Chief Executive Officer of RNAM. As per March 2017, RMF manages the highest assets from the ‘beyond Top 15 cities’ category across all AMCs in the industry. RNAM acts as the advisor for India focused Equity and Fixed Income funds in Japan (launched by Nissay Asset Management) and Korea (Samsung Asset Management). RNAM also manages offshore funds through its subsidiaries in Singapore and Mauritius thereby catering to investors across Asia, the Middle East, the UK, the US, and Europe. Reliance Nippon Life Insurance Company is among the leading private sector life insurance companies in India in terms of individual WRP (weighted received premium) and new business WRP. The company is one of the largest non-bank supported private life insurers with over 10 million policy holders, a strong distribution network of over 700 branches and over 75,000 advisors as on March 31, 2017. The company holds one of the top claim settlement ratios in the industry: it stands at 95.21% as of March 31, 2017. Ashish Vohra is the Executive Director and Chief Executive Officer of RNLI. In fiscal year 2016, after the enabling regulations, Nippon Life increased its stake in Reliance Life from 26% to 49%, subsequent to the receipt of all regulatory approval. Nippon Life Insurance, also called Nissay, is Japan's largest private life insurer, with 25% market share. The company, with over 29 million policies in Japan, offers a wide range of products, including individual and group life and annuity policies through various distribution channels. It mainly uses face-to-face sales channel for its traditional insurance products. The company primarily operates in Japan, North America, Europe and Asia and is headquartered in Osaka, Japan. It was ranked 114th in Global Fortune 500 firms in 2016. Reliance General Insurance Company Limited is an Indian insurance company, part of Reliance Capital Ltd. The firm has a 7.3% market share in the private sector and has the largest agency channel, with over 24,500 agents. The CEO and Executive Director is Rakesh Jain. The company has strengthened and diversified its distribution network by forging partnerships with major banks. Reliance General Insurance is an active participant in various government crop insurance schemes, including the Pradhan Mantri Fasal Bima Yojn,a and has insured over 3 million farmers under this financial inclusion initiative. The total gross written premium (GWP) for the year which ended March 31, 2017, was ₹40.07 billion (US$560 million). Reliance General Insurance (RGI) offers insurance for auto, health, home, property, travel, marine, commercial and other specialty products. Reliance Commercial Finance is among the leading lenders in the Indian non-banking finance sector. The CEO and Executive Director of the company is Devang Mody. The company has an operational presence of over 44 locations in India and an AUM of 16759 Cr. as on March 2017. Reliance Commercial Finance offers a wide range of products which include business expansion loans, property loans, vehicle loans, construction equipment loans, infrastructure, microfinance and agriculture loans. The company had a loan book at ₹124.36 billion (US$2.1 billion) as on March 31, 2017, with over 268,278 customers (including microfinance) across India. Ravindra Sudhalkar is the CEO and Executive Director of the company. Reliance Home Finance Limited (RHF), a 100% subsidiary of Reliance Capital, provides home loans, LAP, construction finance, and affordable housing loans.The company has over 1,750 distributors serving over 33,300 customers across 90 locations, through a hub and spoke model, across the country. Reliance Securities, the broking and distribution arm of Reliance Capital, is one of India’s leading retail broking houses. B Gopkumar is the Chief Executive Officer and Executive Director of its broking and distribution business. The distribution business has approximately 80 branches. Reliance Asset Reconstruction is an asset reconstruction company, the principal sponsor/shareholder of which is Reliance Group (through Reliance Capital). The AUM as on March 31, 2017 stands at Rs. 1,829 crore (previous year: Rs.1488 crore). In 2011, Reliance Capital sold 26% stake in its life insurance business, Reliance Life Insurance, to Nippon Life Insurance (Nissay), amongst the world's largest life insurers, with an AUM of over 600 billion. The transaction was completed at Rs. 3,082 crore for a 26 per cent stake, valuing Reliance Life Insurance at $2.6 billion. In 2012, Nippon Life Insurance bought 26% stake in Reliance Capital Asset Management for Rs. 1,450 crore. Reports indicate that Reliance Capital is also planning to sell a 26% stake in its general insurance business, Reliance General Insurance, at an appropriate time. India's leading financial daily Economic Times wrote, "Since Reliance General Insurance is one of the leading players with 8.4 per cent market share, the proposed stake sale is expected to generate handsome capital gains for Reliance Capital... Besides de-leveraging the balance sheet, the ongoing restructuring should also help Reliance Capital conserve capital and generate better return ratios." Reliance Capital in July 2014 announced the merger of its global film and media services business with Prime Focus to create an entity with a combined turnover of over Rs 1,800 crore. In July 2017, it sold its 1% share in Paytm to China's Alibaba Group for Rs 275 crore, making a profit of 2,600%. ^ "Reliance Capital About Us". Reliance Capital. 3 July 2014. Retrieved 4 July 2014. ^ "Reliance Capital Profile". India Infoline. 3 July 2014. Retrieved 4 July 2014. ^ "Reliance Capital Board". Reliance Capital. 12 May 2011. Retrieved 4 July 2014. ^ "Reliance Capital History". The Economic Times. 12 May 2011. Retrieved 4 July 2014. ^ "Reliance Capital NBFC" (PDF). BSE. 12 May 2009. Retrieved 4 July 2014. ^ "Reliance Capital gets top ratings from Crisil, Icra". Economic Times. 21 October 2011. Retrieved 14 July 2014. ^ "Reliance Capital Rating" (PDF). ICRA. 12 May 2014. Retrieved 14 July 2014. ^ "Reliance Capital Rating". Business Standard. 12 July 2014. Retrieved 14 July 2014. ^ "Reliance General Q1 gross written premium up 25% at Rs 706 crore". economictimes.com. Retrieved 30 July 2013. ^ "Reliance Life Nippon Life" (PDF). Reliance Capital. 9 October 2011. Retrieved 15 July 2014. ^ "Reliance Life Nippon Life". WSJ.COM. 9 October 2011. Retrieved 15 July 2014. ^ "Reliance General stake sale". Hindu Business Line. 12 November 2013. Archived from the original on 7 April 2014. Retrieved 1 April 2014. ^ "Reliance General stake sale". Hindu Business Line. 24 March 2014. Retrieved 15 July 2014. ^ "Rel Cap announces media arm merger with Prime Focus". Moneycontrol.com. 24 March 2014. Retrieved 15 July 2014. ^ "Reliance Capital pockets a 2650% return from Paytm investment".